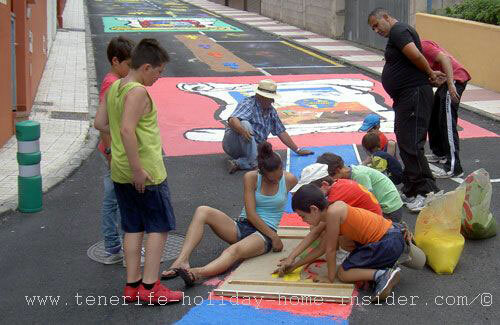 Tenerife salt art in street unites young and old of Los Realejos. 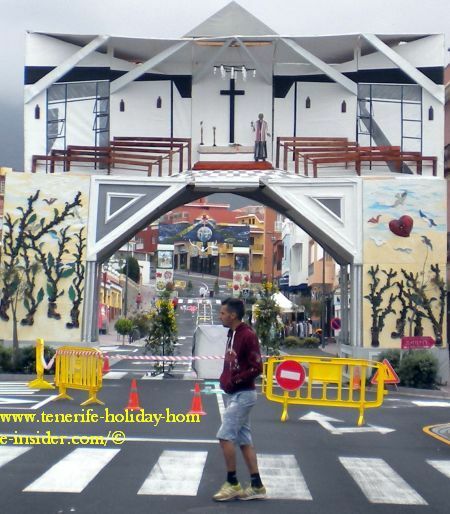 Take a Tenerife trip to see salt art of Toscal La Longuera. Find it in Calle La Pintora which makes a u-turn behind the block of buildings opposite the Shell service Station. By the way, this was not the case in 2015 because of sudden heavy rains. Therefor, less design was put up in the main road of Toscal Longuera after the rains. The following picture gallery also emphasizes the rest of the impressive Corpus Christi decoration with its two magnificent portals. The salt carpets joined the two town gates. What about such community work? There definitely is a social spirit of solidarity and more amongst the street artists whose joint labor of love isn't the most comfortable. Notice them crouching, lifting, stretching and bending knees and backs to reach the road surface with heaps of colored salt. Virtually every salt carpet starts off with a large sheet of butcher paper which was slightly glued to the ground. There, drawings and also wooden stencils help the craftsmen making salt carpets. They serve to fill in salt in strategic points to create different designs. What about the carpet topics? By the way, not every motive of salt art of Corpus Christi is religious. Needless to say, the Recession took its toll. It influenced salt carpet design ideas of 2012. A rather interesting street carpet is depicted above. This most striking salt art also hints at Germany's capital. The stunning figure of a moving athlete together with the word Berlin draw you in. Some of the colors even match those of the surrounding street. 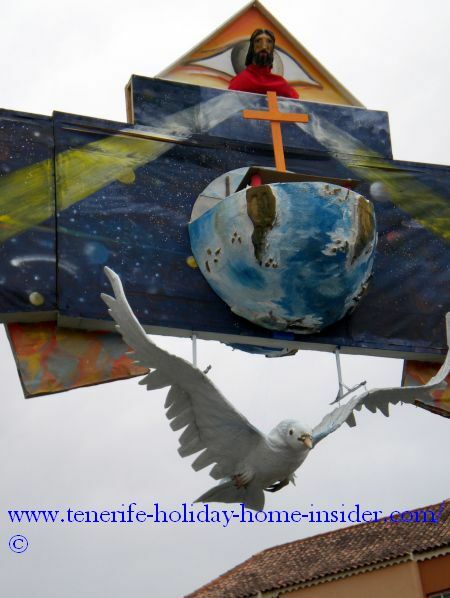 Also, note the cheerful spirit in this Tenerife salt craft. All the street art was a continuous theme of large carpets of salt joined by small salt rugs. The latter were composed of no more than three colors with simple ornaments in their middle. The Realejos emblem was imprinted in one big Alfombra de sal (salt carpet) street rug. Its design looked very neat. Another carpet made with the salt from the sea showed some somber motive. There, a blue coffin, a fire and and some details of Catholic traditions were part of the scene. The added word Wuytila wants an explanation. I leave the interpretation of its meaning to all who may study it. 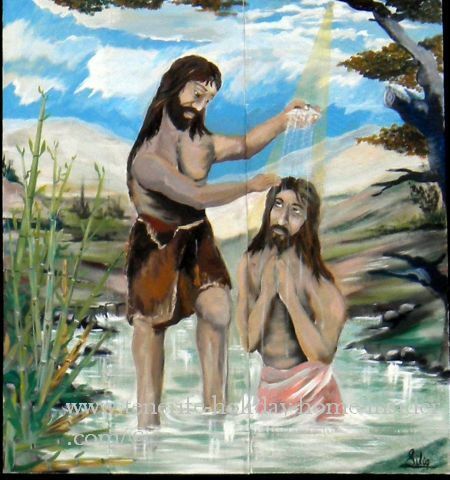 You would never have detected the parish priest Gabriel Benítez Pérez. Indeed, he was one of the carpet artists on that Saturday of June 09, 2012. He looked like any of the young men, as he was dressed in a blue t-shirt and jeans. He was deeply involved to create a catholic street scene with salt. Later by 6.30 p.m., he would hold mass at the village church Toscal Longuera which is called Nuestra Señora de Guadalupe. There, many bags of salt were used in its front to create the biggest carpet of the neighbourhood. In the afternoon, the priest would lead on the church parade to round off the day. All carpets would be trampled in its process by the feet of actively participating church members. They would be part of the Corpus Christi street procession. 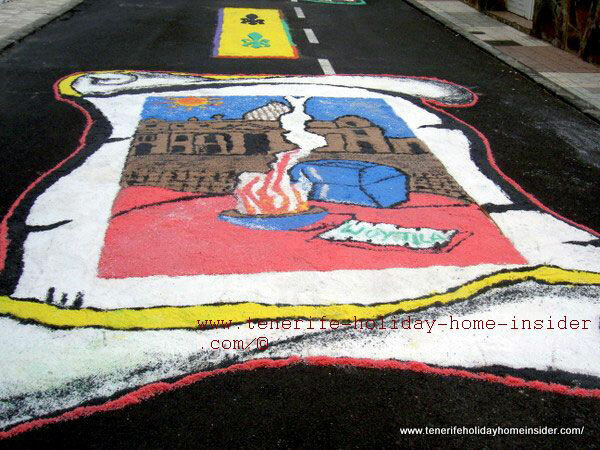 By the way, more and more suburbs in Tenerife North create street carpets with salt for Corpus Christi. The last ones I spotted were in the fishing village Punta Brava and on Plaza de la Iglesia the church Place by Café Ebano. 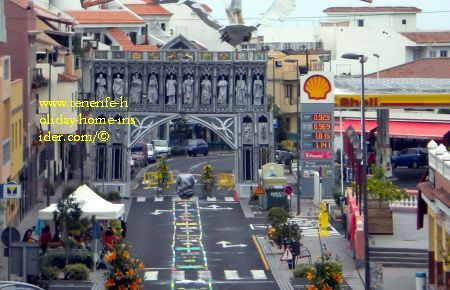 By the way, the earliest known street carpets near Tenerife were composed of salt, way back in 1930 in Lanzarote until the end of the Franco era. 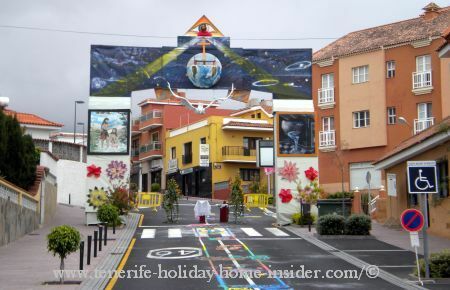 The most spectacular street covers are the Corpus Christie Orotava flower carpets with most striking Tenerife street art of volcanic sand. From salt art back to most Cosmopolitan suburb of Realejos. Mind that even Facebook, such as the Toscal Parroquia can help to learn Spanish easily. 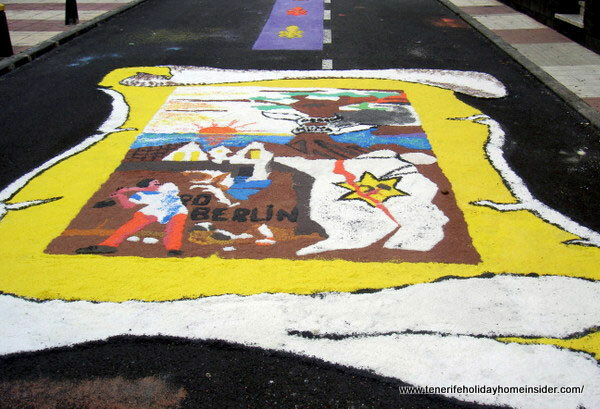 In fact, there is a new trend for Corpus Christi street carpets made of salt in more and more locations on the island. Often, it happens in several suburbs of a town, such as in Puerto de la Cruz in Punta Brava as well as in its hub.